I recently taught a hundred parents, educators, and occupational therapists in Austria and Germany, and this month I’ll be teaching in Australia and Indonesia. Yet, when I started my career—as a public school teacher and certificated reading specialist in Los Angeles—I had no idea I’d ever teach abroad in a score of countries. As one who’d experienced many early learning challenges, I was aiming only toward a doctorate in education so that I could give support to struggling young learners. 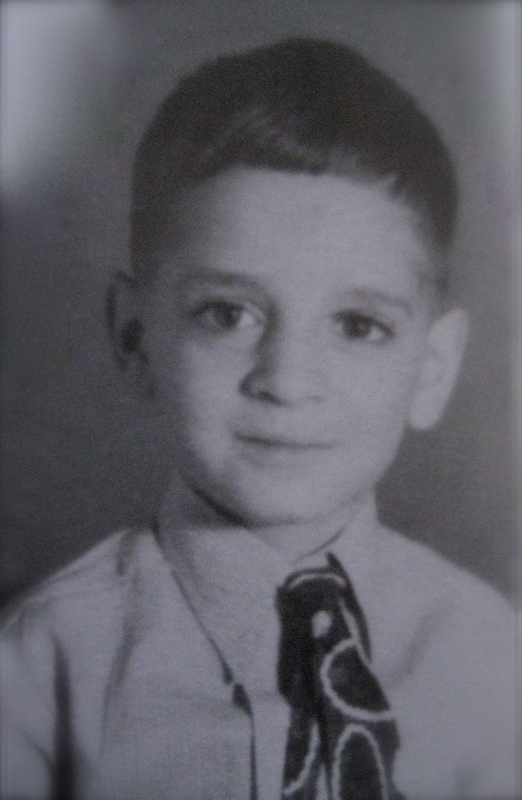 Joining the faculty at Malabar Street School was a pivotal experience for me. It was there that I first observed, while working with children, how true learning can always be identified by the satisfaction it brings. At Malabar, I saw the value of sensory learning. I also realized that the most effective teaching acknowledges learners where they are, and then fosters in them an intrinsic motivation to explore the new and unknown. Under Dr. Brown’s guidance, I went on to complete my doctorate in education, and received an award for outstanding research on the relationship of covert (silent) speech, or auditory processing, to beginning reading achievement. Although auditory processing ability is important, my research suggested that other modalities were also essential for reading acquisition. My advisors had recommended that I continue my research into early reading, and I at first considered doing so. Yet I soon saw that even important new research is rarely effectively applied in the classroom. I realized that I didn’t want to be stuck in an ivory tower, conducting studies whose findings might never be implemented. I wanted to make a more direct contribution to the lives of young learners. 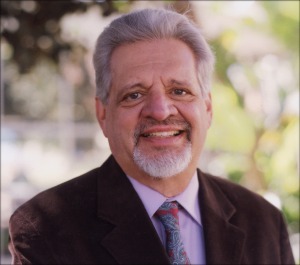 In 1970 I opened a reading center in the San Fernando Valley, and, while completing my doctoral studies and continuing to teach at all grade levels, I met and worked with several developmental optometrists. I began reading the extensive research gathered by the Optometric Extension Program, and recognized how this clarified my own dissertation studies and findings. Thanks to my optometrist associates who used movement experiences in their vision-training work, I realized with a big aha! 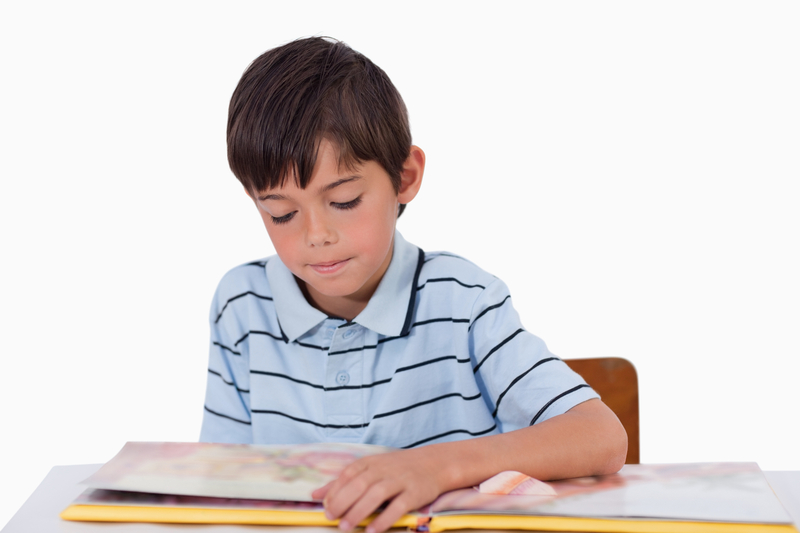 that it’s the lack of specific physical skills related to focal attention, rather than language development, that disrupts the early reading process. I saw that many learners are not able to move their eyes together into the left and right visual fields, or to move their eyes separately from the movement of the rest of the body. Movement is the missing link that prepares beginning readers to achieve. Learners experience less stress and greater ease when they can work in the visual midfield, where the left and right visual fields overlap. As I applied my studies in the classroom, I continued to see, from observing the children, that learning to read requires many abilities—not any one alone. The best beginning readers were skilled not only in silent speech, but also in the visual, kinesthetic, and tactile modalities. To verify that the skills of reading can be readily acquired through a multidisciplinary approach, I initiated my own “action research” with students of all ages and social backgrounds. In this endeavor, I used each five-step lesson plan (called a balance) to convey the learning as something specific, relevant, measurable, and transferable. The students learned to ready themselves for learning (an early version of what is now known as the PACE process), and then noticed their baseline skills, determined for themselves the next appropriate steps in their learning process, experienced how movement provided them with more resources for accessing the learning, and enjoyed their immediate improvements. I used the new Edu-K work I was developing to give Javier a balance for using both eyes together as he crossed his visual midline, a skill necessary for reading with ease. As he picked up his book a second time, only minutes later, he could point his eyes steadily at each word. He now read with fluency, and with an ease and comprehension that his mother and I hadn’t heard from him before. As a classroom educator, I soon learned that two hands are better than one, two eyes are better than one, and a whole body moving is more ready to learn than one sitting and staring. I call this whole-brain integration. I support children (and adults) in experiencing how to “locate themselves” in space through proprioception. Spatial orientation is the ability to represent the location of objects with respect to oneself. I find that the inability to do so is evidenced by such signs as an avoidance of the body’s midline, where the left and right visual fields overlap. Imbalance also shows up as chronic difficulty in sitting in a chair, a twisting of the hips, an inclination to avoid using the non-dominant hand, a tilting of the head, and various reading and learning challenges. Yes, youngsters can easily avoid the midline and still learn in a one-sided way. They can even get good grades that way, yet they’ll do so under needless strain. I see that, although not yet well recognized as such, the challenges that show up, now or later, in the form of stress or health problems often stem from an inability to maintain sensory integration during the learning process. Students having difficulty in the classroom can develop their innate abilities by learning how to cross the midline and work in the midfield, using both left and right sides to process visual, auditory, tactile, and kinesthetic experiences. I see daily how learners who reconnect this way with whole-body movement patterns discover a natural love of learning. Realizing the importance of whole-body movement, I went on to develop Dennison Laterality Repatterning and Three Dimension Repatterning*, processes that have helped thousands to better coordinate whole-body movement with eye movement. I also used these processes to help integrate the asymmetrical and symmetrical tonic neck reflexes and other infant reflexes** that, when unintegrated, can otherwise pull us out of structural and focal alignment. I believe that the visibility of my last thirty plus years of innovative work with learners worldwide has stimulated some good research*** supporting my move-to-learn premise as well as many other premises of my work, and that time will reveal the commonsense basis of Edu-K thinking. Meanwhile, I see my consultation time as an opportunity to show each learner how to let go of fixed ideas he might have about his abilities and discover learning as an active process. I love being in the moment with students, helping them move, learn to play, and learn to learn. *The intention behind the Dennison Laterality Repatterning and Three Dimension Repatterning processes is to make habits of movement easier and more efficient, and so to free thought for choice, expression, and creativity. These simple processes are taught in Brain Gym® 101: Balance for Daily Life. **The Edu-K work also addresses asymmetrical and symmetrical tonic neck reflexes in the Total Core Repatterning course. *** See Research Nuggets. See also this landmark study on invented spelling by Ouellette and Sénéchal, 2017. © 2015 by Paul E. Dennison; updated 2017. All rights reserved. Click here for a translation of this article into Chinese. Brain Gym® is a trademark of Brain Gym® International/the Educational Kinesiology Foundation. Click here for the name of an instructor near you. Note: There are more than 100 action research studies, done independently (though not peer reviewed), on the effectiveness of various Brain Gym® activities. Click here to see years 1988 – 2000 in the Research Studies Packet, the balance are listed in the FAQs (same link) and Brain Gym Journal and Global Observer archives. 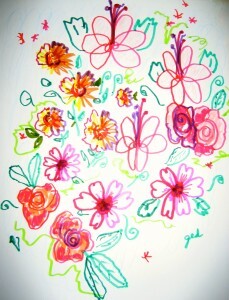 Playful flowers, leaves, and curlicues drawn with two hands at once make a colorful design. In the image that you see here, I’ve included five distinctive radial flower shapes that I often use in my workshops with teens and adults of all ages. I’ve taught the more simple shapes to children as young as five (though please be sure they can do one shape easily before showing them more). 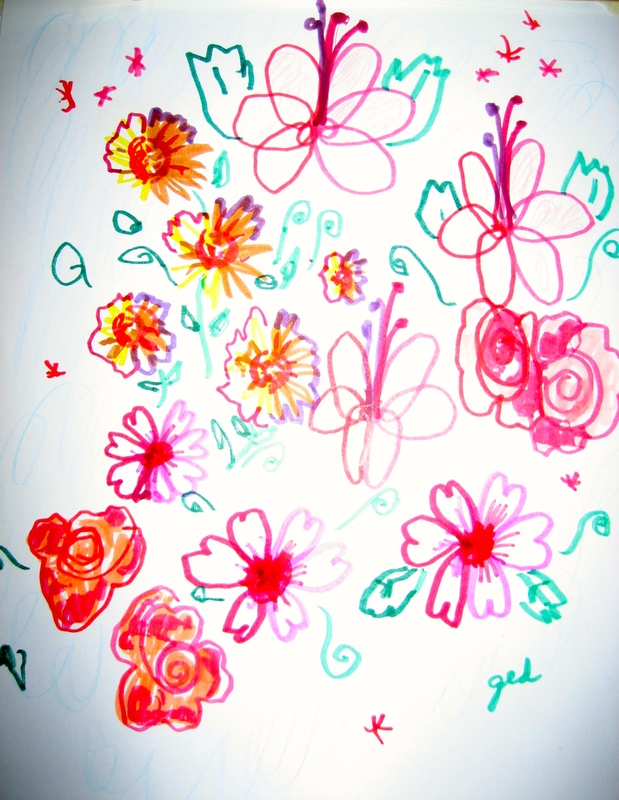 People generally find the making of Double Doodle flowers to be a calming and reflective activity—one they are often surprised that they can do. Begin by taping your paper to a smooth surface. Then take a moment to relax yourself, especially your arms, by doing a few strokes of the Cross Crawl, all of PACE, or perhaps Lazy 8s or the Arm Activation, if you’re familiar with these. This will help you orient yourself to the page in terms of your center—your sternum—while simultaneously feeling the reach of your arms and symmetry of your hand motions. I made the above left image while standing at a table, as I often do. Or you might want to work on an easel. You might begin with a dandelion-like design. 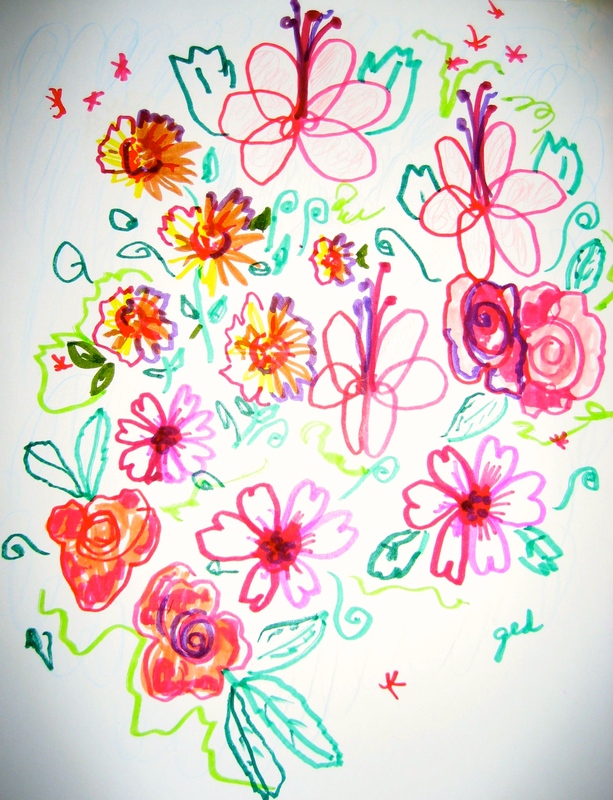 An image like this does not require working on the midline of the page, but calls for us to see the midpoint and midline of each individual flower-shape that we draw. 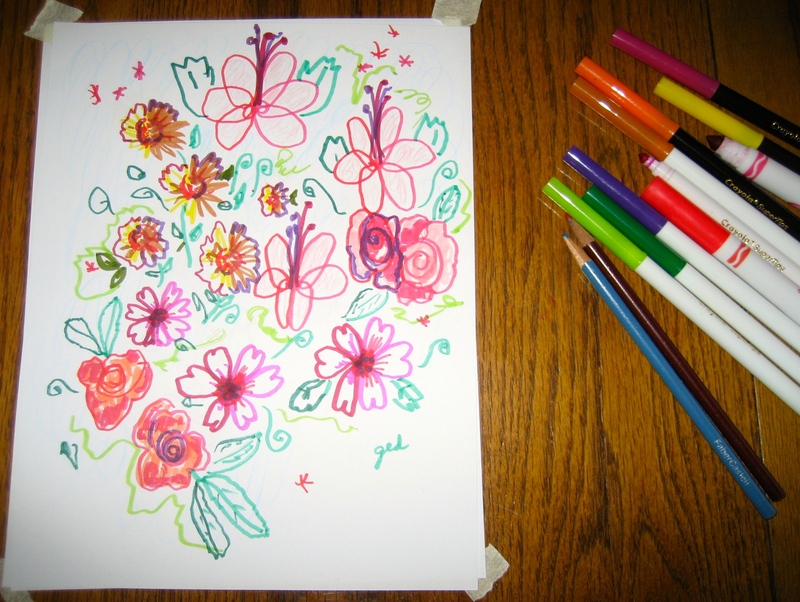 You might begin, as I did, with a different colored marker in each hand, with the marker tips resting next to one another in the center of your visual field. 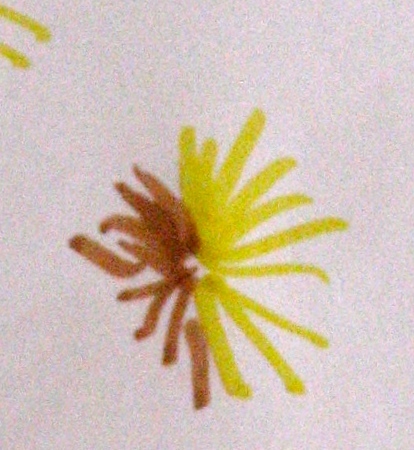 I first drew a dandelion-like design: With both hands on the center point of your dandelion, create outward strokes away from the middle to make the shape. 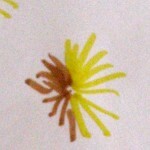 Add more dandelion shapes to your bouquet, as you like. 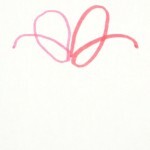 The first petal motion for the Looping Flowers. 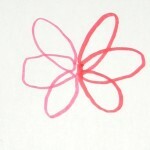 loop back up; the second petals move down, then loop up and out diagonally, the third loop out to the sides, and so on. 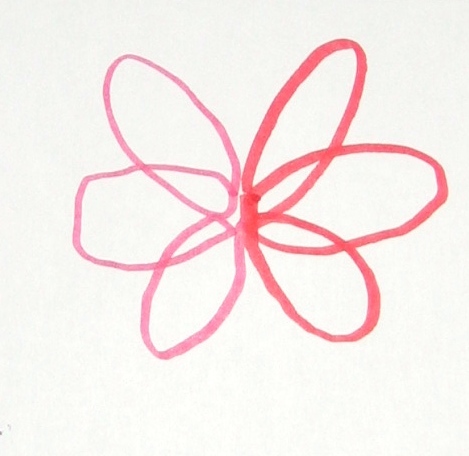 A completed Looping Flower shape with six petals.loop (see the image at left); the 2nd petals are made as your hands move out to thesides, in toward the middle, and then loop; the 3rd petals are similarly made with a downward, then upward motion. The first two petals for the Heart-Petal Flower. 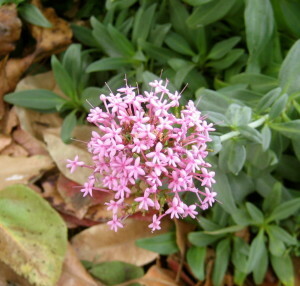 The third flower has tiny heart-shaped petals (see image at right). 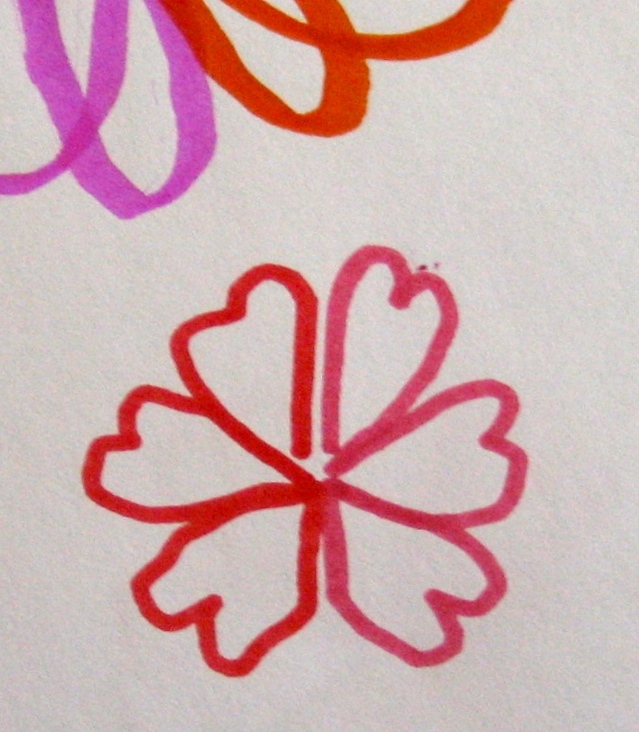 Simply draw two hearts at once, side-by-side, to make the top two petals, then continue with the side and then the bottom petals. 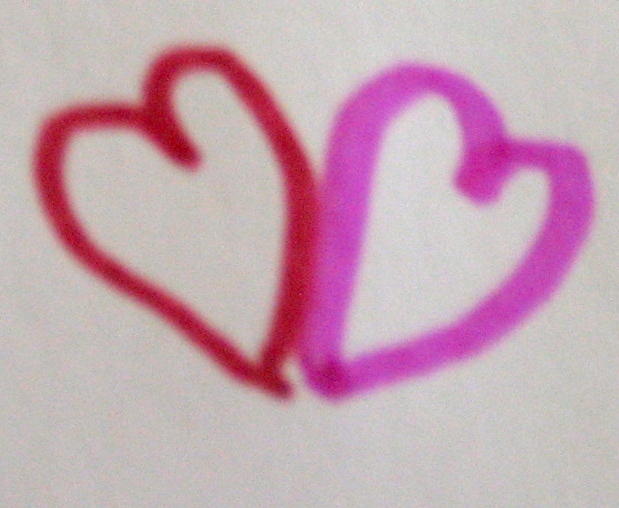 You can walk around your paper or draw the hearts upside-down. Again, this is most fun to do in a smooth, flowing motion. As you work, let yourself—your movement and looking—be more and more from a place of comfort and soft focus. Doing the Double Doodle invites relaxation of the eyes and hands, so if you feel yourself tensing up with old movement patterns, pause and do more large motor movement before continuing. Next, I made two playful roses at once, by first drawing the calming outward spiral, then encircling it with two or three rounded waves to suggest the thick and sensuous petals . The fifth flower is simply made by drawing two 6-pointed stars at once: Your two (fine-point) markers touch at the midpoint, then quickly brush out and away to make three radiating lines. Can you find my ten tiny Star-Flowers? Finally, you can add leaves, curling vines, or curlicues, to fill the space. 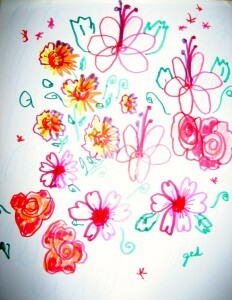 If you wish, go back to each flower and layer it with two (or even three) more colors, as I did. With your dominant hand, you might color in a shape or two, or add other asymmetrical touches, as you like. 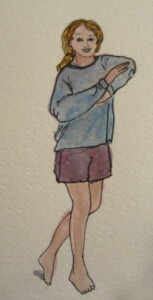 I used a variety of thick and thin colored markers, as well as two colored pencils. I’m confident that you’re final image will surprise you with the joy of coordinating your hands and eyes, and the beauty and mystery of asymmetry that seems to accompany the Double Doodle process. 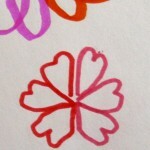 For more information on the Double Doodle, read A Soothing Double Doodle Heart for Kids of all Ages. The Double Doodle is one of the 26 Brain Gym® activities, from Brain Gym®: Teacher’s Edition, by Dennison and Dennison. To find an instructor of the workshop Double Doodle Play: A Window to Whole-Brain Vision, developed by Gail Dennison, click here. For a translation of this article into Spanish or Catalan, click here or paste http://kinemocions.com/ca/primavera-cinco-flores-con-dobles-garabatos/. Brain Gym® is a trademark of Brain Gym® International. For more information, or to find an instructor in your area, go to www.braingym.org. (C) 2014 by Gail Dennison. All rights reserved. Paul at age 6 1/2. My fingers shook and my eyes ached as I tried to print the letters of the alphabet and stay on the line, as the other kids were doing so successfully. As she walked around the classroom, my second grade teacher, Miss Murphy, would make quiet comments about each student’s work. “Stephen is making beautiful, round o’s. I like how Sylvia is holding her pencil. What perfect, even, neat circles Nathan is making for his o’s.” Miss Murphy never commented on my work, though, and I knew that this was because my o’s were never round enough, no matter how hard I tried. I felt bewildered during writing lessons. Everything went so fast; I couldn’t seem to slow time down enough to master and control the pencil. When I tried to coordinate my eyes with my hand movements, I would often get stomachaches and double vision. I wondered how the other children moved so quickly. They made it look so easy! What was wrong with my o’s? My work just didn’t come out the way I wanted it to. 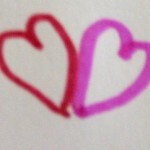 In my mind’s eye, I could see the o’s as smooth and round; yet, on the page, each one I drew came out jerky and uneven. I tried to shut out much of what I experienced in school, for it didn’t seem of any use. My wooden desk, too big for me, was uncomfortably hard and awkward to sit in. I felt lost in it, my feet barely able to touch the floor. Things and people in the room felt far away, and I longed to move and use my muscles. My stomach often hurt, and the most I could hope for was that no one would notice me. As a left-hander in a right-hander’s world, I always felt that I was swimming against the tide. In my inner listening, I could sense Miss Murphy and the other children moving together in a rhythm all their own—one that was foreign to me. I felt myself falling behind, and tried to move more rapidly to keep up. I still hold vividly in my memory that long-ago struggle with the pencil. As that particular second-grade lesson transpired, I suddenly began to notice myself and my anxious situation with the detachment of a kindly observer. This was a pivotal, living-dream memory that I sensed would stay with me, like a jewel in a treasure chest, for the rest of my life. Although I still felt alone and helpless in my awareness, this moment was a gift. As each new lesson took place, I now began to experience my situation and notice the whole scene taking place before me. This ability to self-observe was my prefrontal cortex—the brain’s center of self-awareness—in action. The brain’s prefrontal cortex holds the essence of our humanness and is an integral part of every learning experience. When we can witness our behavior and evaluate it, we can act on it and change it. Otherwise, we keep repeating the same behavior ad infinitum and never learn. These frontal lobes of the cerebrum develop simultaneously with the rest of the brain as we grow through childhood, through our teenage years, and on into adulthood. As we learn to sense, move, feel, and think for ourselves, thanks to the prefrontal cortex we’re able to notice and code our experience of these various functions. I couldn’t know, back in Miss Murphy’s class, what I know now—that, when I picked up the pencil, I was focusing too hard on that one fragmented piece, unable to sense or feel the whole spatial context of my body and hand motions, unable to stop and think. I was still in a stressed state—withdrawing and contracting as if I were trying to become invisible in the room. I was experiencing common stress responses: Dizziness, muscular tension, breath holding, increased heart rate, a sense of accelerated time, and, as the pupils of my eyes dilated, an inability to access peripheral vision. As my tension increased, I remember tightening my grip on the pencil. I was seeing more and more of what stressed me—the pencil moving on the page—and experiencing less and less of myself. Everything seemed reduced to a fast moment—one with which I could never catch up. I repeatedly felt the sense of something rushing toward me—the teacher; noisy, pushy classmates; or a test—yet I could never work quickly enough to feel ready for what was coming. Years would pass before it occurred to me that I could never, ever go fast enough to get ready for learning, and that what I really needed was to slow down. My attention was too much on time and not enough on space. Until that first moment of self-aware noticing, I had felt completely overwhelmed and unable to follow what was going on in classroom. Soon after my new experience of self-reflection, I began to examine my abilities, plan my own learning steps, and take responsibility for teaching myself. And this was only the beginning: within the next three years I would discover how to connect this noticing with my sensory processes. 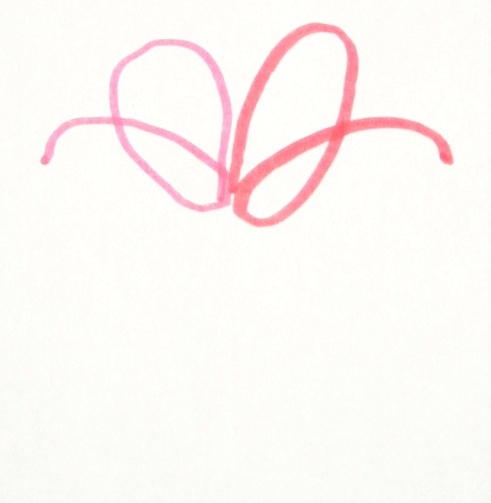 For instance, such things as the movement of my hands and my tactile experience as I formed letters would eventually help me with my handwriting, and there were innumerable other instances of such useful new connections. Paul Dennison, author, movement educator, and authority on reading instruction. Author’s note: Some forty years later, in the early 1990s, I developed the four-step PACE process that students in more than 80 countries use today to help them notice, experience their spatial awareness, and feel ready to learn. Excerpted from Brain Gym® and Me: Reclaiming the Pleasure of Learning, © 2006 by Paul E. Dennison. © 2014 by Paul E. Dennison. All rights reserved. Brain Gym® is a trademark of Brain Gym® International/the Educational Kinesiology Foundation. Click here for the name of an instructor near you. Eyes and Ears on a Scavenger Hunt! 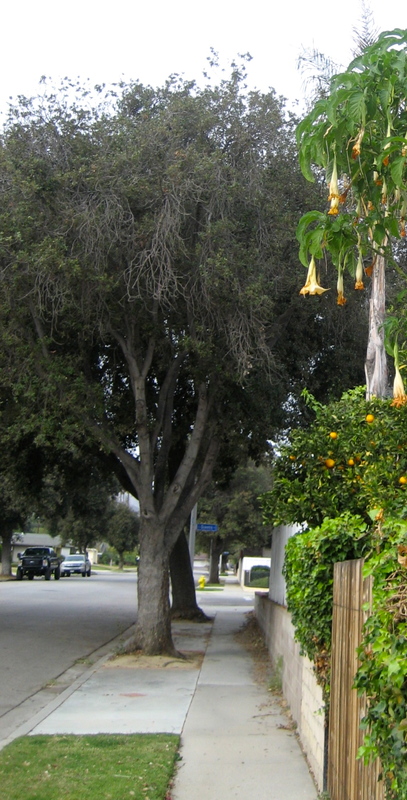 A view down the street. “A scavenger hunt!” she said, lighting up. “Let’s go for a walk and find things.” I didn’t have a pre-made list, so I proposed to write out a list of 20 items for her to find. She said that she’d make 20 for me to find, as well, and I could tell by her smile that she was already thinking up some good ones. We both laughed as we heard, outside, a crow cawing, seeming to signal a starting point. We each took an index card and pencil. On my card I wrote: A talking crow. She wrote: A long piece of grass. We wrote quickly. H paused just to ask about spellings. We glanced at each other’s cards only once or twice, then completed our lists and, in no time, were ready to go. We got into PACE*, did The Thinking Cap, and started out meandering around the block. Everything seemed fresh and new. I was looking for the first item H had written on my list: A piece of long grass! But all the grass appeared freshly mown. “Grandma, do you see any kind of red leaf ?” H was asking. 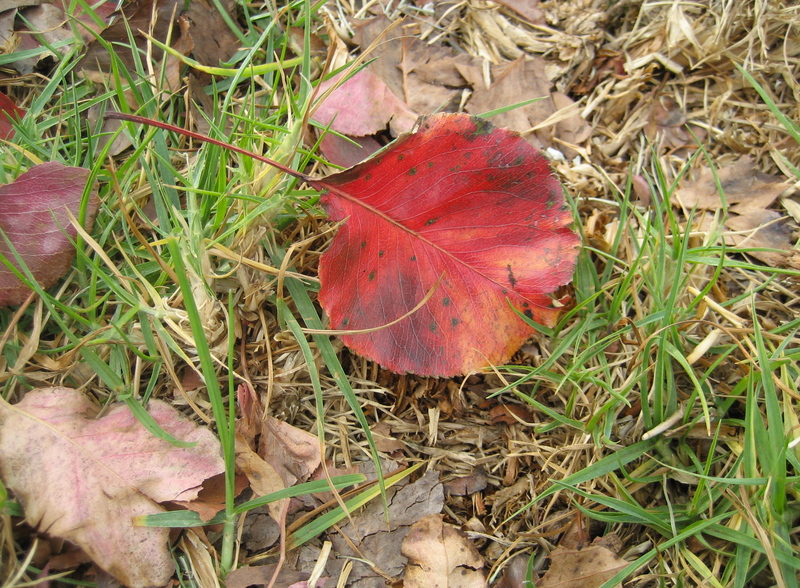 She then ran toward an ornamental pear tree to show me its luminous red and gold leaves beneath. We oohed and aahed over the colors. 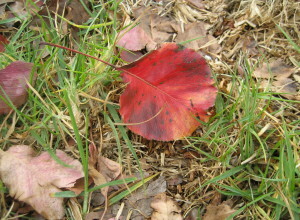 A red leaf from an ornamental pear tree. 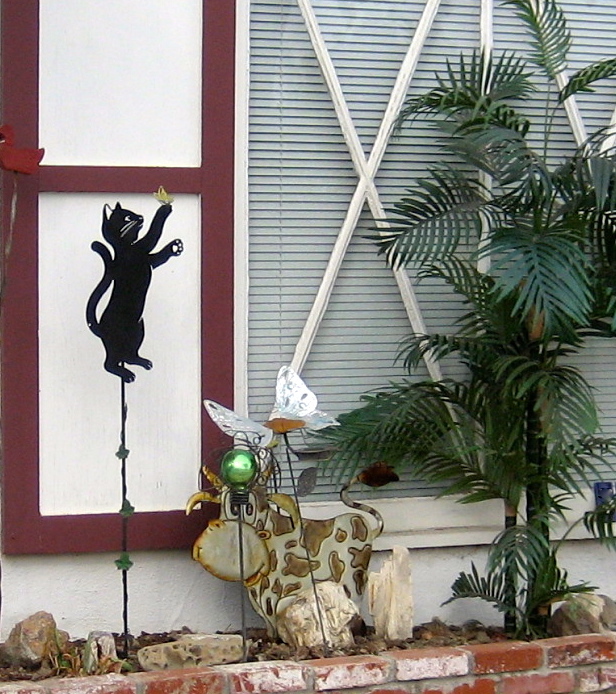 A cat and butterfly decoration works for us both. 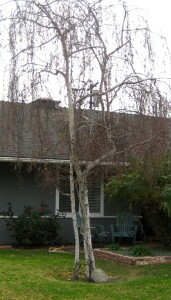 A white birch tree in winter. 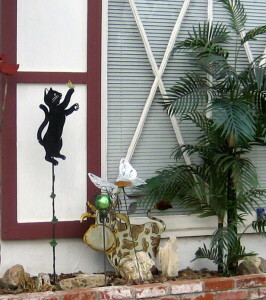 After a fruitless search for a white cat we know, we found a silhouetted sculpture of a black cat catching a butterfly, and decided that could work for both of us. “Grandma, where can I find a birch tree?” H asked next. 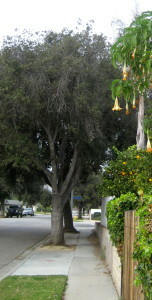 I explained that we were looking for a tall, slender tree with diamond-shaped “eyes” on its white, papery bark. 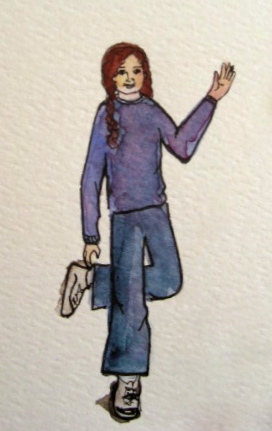 In the air I drew an upward arch with my hand as I described its flowing branches. Looking around, H pointed down the street. “Oh, I know. Is that one?” We walked closer to see. Yes. 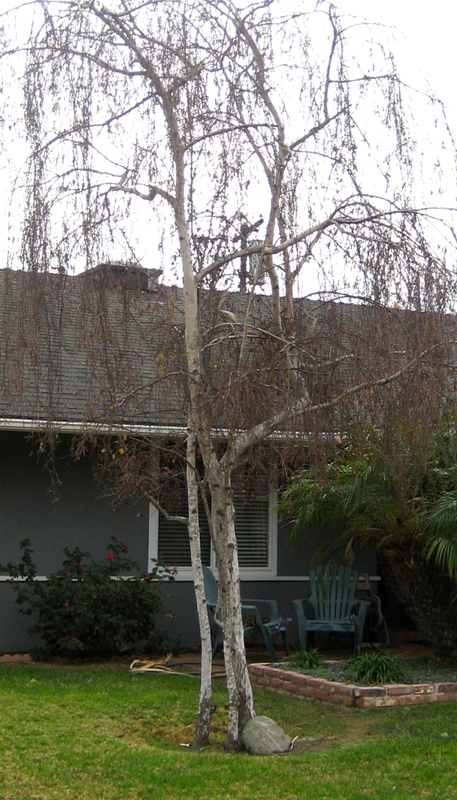 I told H that a birch tree is sometimes called “The Watchful Tree” because of its eyes, and is also sometimes called “The graceful lady of the wood,” though in winter, she drops all her leaves and is rather plain. She used her thumbnail to measure a tiny flower. Next, H crouched down to the ground and used her thumbnail as a way to measure a tiny pink flower, part of a cluster, to see if she had indeed found A flower no bigger than your thumb nail. I noticed how, in traveling just this short distance from our house, we had slowed time down in a wonderful way. By now, we had checked off about half our items. We had experienced an array of sounds and quietude. We had explored moving and still images, shape and texture, light, shadow, and color, and near and far vistas. We could turn back toward the house now, but decided to go the long way around instead. What would we discover next? Learning to use the senses doesn’t require being taught in a linear way. In fact, as pioneering educator Maria Montessori showed us, it’s more about being interested in learning for ourselves, while providing an environment that will engage the child’s desire to explore and discover. Actively looking around out side, as we were doing, naturally trains scanning, depth perception, eye teaming, and many other visual skills. In 1989 I began teaching Visioncircles***: 8 Spheres of Perceptual Awareness, a course I developed in natural vision improvement. Since that time, I’ve seen repeatedly, with hundreds of students, that vision is a learned skill of attention, and that we can continue learning new visual and sensory skills throughout our lives. Further, I see that in all the ways that we teach children, we’re teaching them (for better or worse) how to see and to use their senses. Let’s take every opportunity to engage a broad range of sensory and motor skills that will support a lifetime of rich multi-sensory interactions. * PACE, a quick and simple way to activate sensory and motor skills for learning, includes four of the 26 Brain Gym® activities. Click here for the name of an instructor near you. PACE, and the 26 are also described in Brain Gym®: Teacher’s Edition by Dennison and Dennison, © 2010. **G. N. Getman, O.D., How to Develop Your Child’s Intelligence (1992). ***To find a Visioncircles Instructor in your area, click here. See also: The Vision Gym activities, described in Vision Gym®: Playful Movements for Natural Seeing, a card set and booklet by Gail E. Dennison and Paul E. Dennison. © 2013 by Gail E. Dennison. All rights reserved. Brain Gym® is a trademark of Brain Gym® International/the Educational Kinesiology Foundation. Watch someone do her first Cross Crawl* and what do you see? For people of any age, doing this activity inevitably brings a smile as they begin to experience the natural ease and rhythm of this integrating movement. Often someone doing the activity will break into a broad grin, pleasurably surprised to be coordinating the whole body at once in a complex movement pattern. 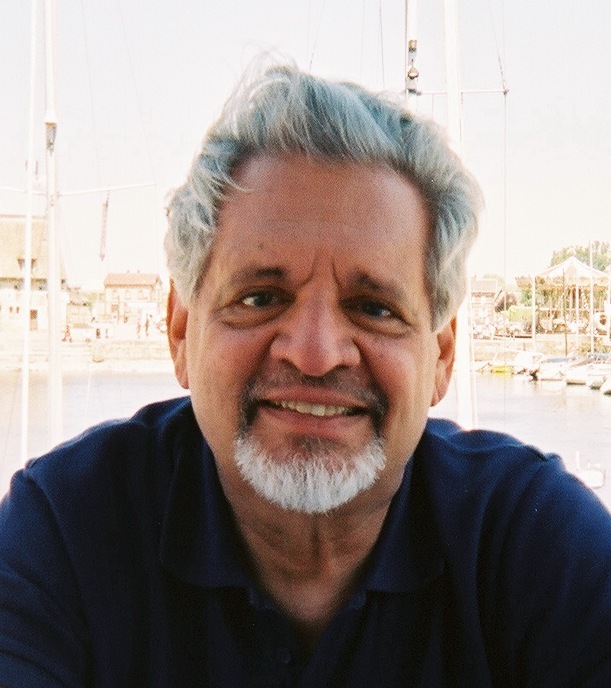 Paul first learned about the possible benefits of doing contralateral movement in the early 1970s during his studies at the University of Southern California, as he reviewed the research literature on the effect of crawling on academic achievement. The experts of that time had concluded that there was no learning advantage to having children replicate the crawling stage by crawling in the classroom. Yet Paul had been included in several optometric assistant in-services in which he had observed children making immediate improvements in both visual skills and motor coordination after doing a standing contralateral motion that involved hitting a hanging ball. He described discovering firsthand the academic importance of the Cross Crawl in his first book, Switching On: the Whole-Brain Answer to Dyslexia, in the story of teaching this motor skill to a 10th grader who had been diagnosed as dyslexic and who was a student at one of his learning centers: For weeks now, in her tutoring sessions, Judy had been getting coaching in phonics and vocabulary building, yet she continued to struggle, word by word, to decode a fourth-grade level reading book. On this day Paul had Judy pause in her reading so he could teach her the Cross Crawl version that he had recently learned. In the few minutes that it took Judy to internalize this contralateral pattern, Paul saw her unsteady and inconsistent motion become smooth, stable, and regular. He then asked her to read again, and heard her voice resounding with confidence, effortless phrasing, word recognition, and comprehension. Judy read like a different person. How had doing a physical activity made such an immediate and apparent difference in that individual’s cognitive process? One hypothesis Paul formed then has since become more valid for both of us based on similar experiences with thousands of our students: For fluency, readers must be able to cross the visual midline where the left and right visual fields come together, and from where eye movement in any direction is available. The Cross Crawl’s contralateral movement pattern seems to help learners to experience coordinated physical integration as the left and right sides of the body work together. 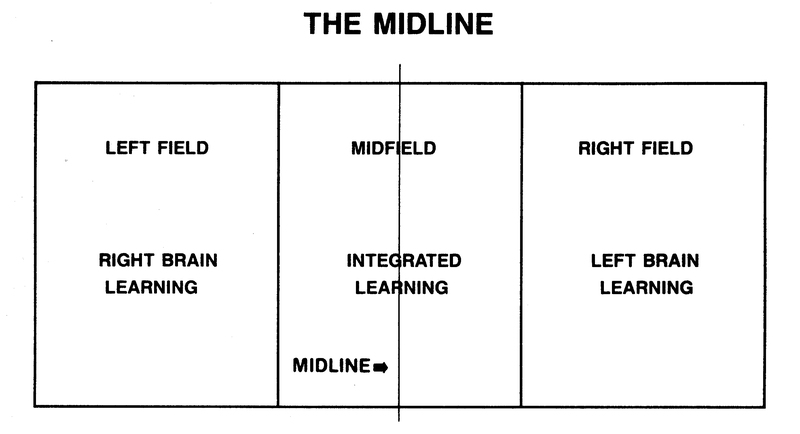 In a basic Cross Crawl or DLR, the hands cross the midline, connecting the tactile, visual, and kinesthetic midfield, where the two sides overlap. In contemporary literature, it’s also become better understood that the brainstem modulates patterns, and locomotor movements are built on patterns. John Ratey, M.D, postulates that when information is arranged in patterns, it is neurologically more easily processed, retained, and retrieved. We further posit that rhythmic, coordinated movement restores the natural equilibrium lost when learners overfocus on symbols and phonetic elements—the decoding aspect of reading—thus inhibiting encoding and the ability to hear the story as whole language with meaningful words and phrasing. Ideally, the encoding of language provides a context for decoding—not the other way around. The human body is bilateral, and the sensory organs of eyes and ears function best when accessing the midfield where left and right sensory input overlap, providing a supportive whole-body context for one-sided activities and allowing the two sides to work together instead of inhibiting one to access the other. Consider that children today engage in few activities, besides walking, running, or swimming, that emphasize alternating bilateral motion, and even these three they do less than their parents did. Yet they take part in many activities that are one-sided. The one-sided activities, such as handwriting or using scissors, are important for developing dexterity and specialized skills, yet the use of one side at the expense of the other is quite different from the use of one side while resourcing both. It is this latter way that we teach in Edu-K.
Today’s most common whole-body activities are sitting at a computer or in front of a TV, neither of which is movement-rich. From eating to drawing, writing, moving a mouse, or riding a scooter (for adults, driving), one-sided motions predominate. physical movement is one vital way by which we connect with our surroundings and ground ourselves in a social environment. 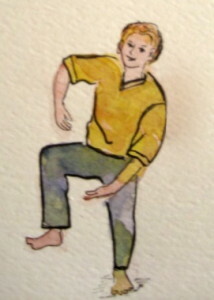 For many years the dance-like Cross Crawl has been Paul’s and my daily practice. We also enjoy doing it as we do the four PACE activities, for work, teaching, or simply before a long walk. We hear that, worldwide, more and more children are enjoying the Cross Crawl as they, too, take a quick break from sitting to rediscover their whole-body movement. What a wonderful way to celebrate our movement and aliveness! Note: In the late 1970s, Paul and I also learned more about the Cross Crawl through our studies of the Touch for Health book and courses, developed by John Thie, DC. However, it was the optometric work and crossing of the midline that initially inspired Paul to develop Dennison Laterality Repatterning and to discover how to use the Cross Crawl activity to teach more effective movement and reading skills. * The Cross Crawl is one of of the 26 Brain Gym® activities described in Brain Gym®: Teacher’s Edition by Dennison and Dennison, © 2010. * Some people initially find it a challenge to access the complex coordination required for doing the Cross Crawl activity. If so, you may want to find someone who knows Dennison Laterality Repatterning (DLR), a simple process used to teach this level of integration so it becomes automatic. The DLR process is included in the course, Brain Gym® 101: Balance for Daily Life and is also offered by instructors through private session work. Click here for the name of an instructor near you. **The Movement Dynamics course, © Dennison and Dennison, 1990 and 2006, includes 30 Cross Crawl variations, accessing three movement dimensions and taught in improvisational and dance-like sequences. The illustrations included in this article are from the manual, © Gail E. Dennison. Katy Bowman. Alignment Matters: The First Five Years of Katy Says. Propriometrics Press, 2013. Michael Whittle. Gait Analysis: An Introduction. Butterworth-Heinemann, 4th edition, 2007.